St Patrick's Day in Ireland is notable for the mass departure of government ministers to foreign lands to promote everything Irish. The distillers have the same idea, knowing that drinkers might be more receptive to sampling their wares while caught up in the spirit of the occasion. 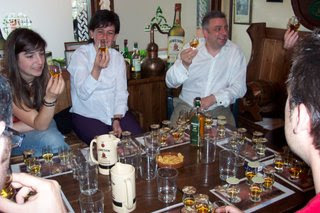 In my expat days I was impressed when I found a bottle of Jameson in a bar abroad, St Patrick's Day or not. Today though, Irish whiskey seems to be reaching all sorts of unusual places. I've never been to the mountainous parts of Switzerland or the Basque region of Spain but I am informed that parched travellers to these spots can count on ready access to a range of Irish whiskey restoratives. The Smallest Whisky Bar on Earth (that is it's name and an accurate description it appears to be too) resides in the municipality of Santa Maria Val Müstair, Graubünden, Switzerland. Wikipedia tells me that the population of Santa Maria Val Müstair is 346. And yet it supports a bar with a better range of Irish whiskeys than most pubs in Dublin. Irish Week (Mar 15-23) at the bar will feature the new Bushmills 1608 Anniversary whiskey and Cooley's single grain whiskey, Greenore. Detlef Sommar also tells me that "our mineral water for this week is green, and we have Irish folk music. 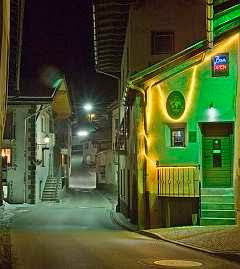 Outside the bar we will have the Irish flag and inside we have a lot of decoration from Guinness, so all is very Irish." Check out the rest of their whiskeys here. Now, from the world's smallest whiskey bar to the world's largest pub collection of Irish whiskey... it's Scanlan's Tavern in Gernika (or, more familiarly, Guernica), Spain. Basque country! Scanlan's is an Irish bar run by the eponymous Patrick Scanlan, whiskey sommelier and Irish whiskey crusader, according to his blog. Patrick runs whiskey tastings and events and has founded the Hibernian Whiskey Society so the Euskaldunak (the Basque people; I'm getting a lot of mileage out of Wikipedia tonight) are well served with regard to our national spirit. St Patrick's Day will be marked with a Jameson whiskey party night on Friday 14th and a Bushmills whiskey/rugby party on the Saturday. Non-whiskey related events include a Tír na nÓg kiddies party in the beer garden on Sunday.